Today’s Bible readings can be found at this link: Psalm 69:1-18 and Matthew 14:22-36. This morning, we are all getting to see the utter devastation of communities and towns along the Gulf coast. The wrecked houses and businesses, churches and stores are unbelievable. The immense destruction is profoundly tragic, especially for those who may have lost loved ones, pets, and possessions because of the hurricane. It reminds us of how frail we all are in the face of the unrelenting forces of Nature. Already, the courageous First Responders are out trying to locate and assist people who are trapped. Most of them are local people, so they will have their own losses and stresses to deal with. Their selflessness and devotion to the communities that they protect and serve are highly admirable. Their humanity is exceptional; their sacrifice is unbelievable. For those of us who have avoided this catastrophe, our gratitude and relief should be not just given to God, but also spent on repairing and renewing the devastated communities. Without outside help, hopelessness and despair languish; without compassion and support, renewal and rebuilding are ineffective. 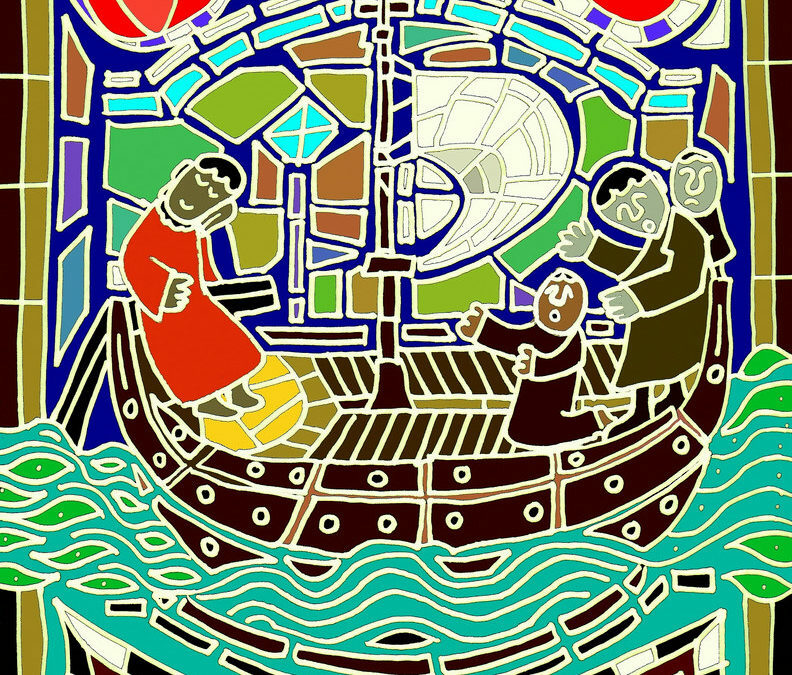 In our PCUSA denomination, we have an organization called the PDA (Presbyterian Disaster Assistance). In times like these, they live up to their motto – Out of Chaos, Hope – by organizing and sending in professionally trained response teams. They make a short-term response assessment and begin the process of supporting the local community. Teams are already heading down there and they can be financially supported on the internet at this link: Hurricane Assistance. We all rely on God to sustain us, no matter who we are or where we live. God, however, gives us enough resources to help others in great need. For those who have been overwhelmed by the flood waters, we become their rescuers and helpers. The storm has passed, so the support begins. Point to ponder: How often have I been helped by others in my life? What can I do to help those in need today? Prayer: Lord Jesus, we pray for all of those who are impacted by the recent hurricanes. We realize that our lives are frail and vulnerable. Help us to reach out to those in need through the giving of gifts, and not just the praying of prayers. In Your Holy Name, we ask. Amen. 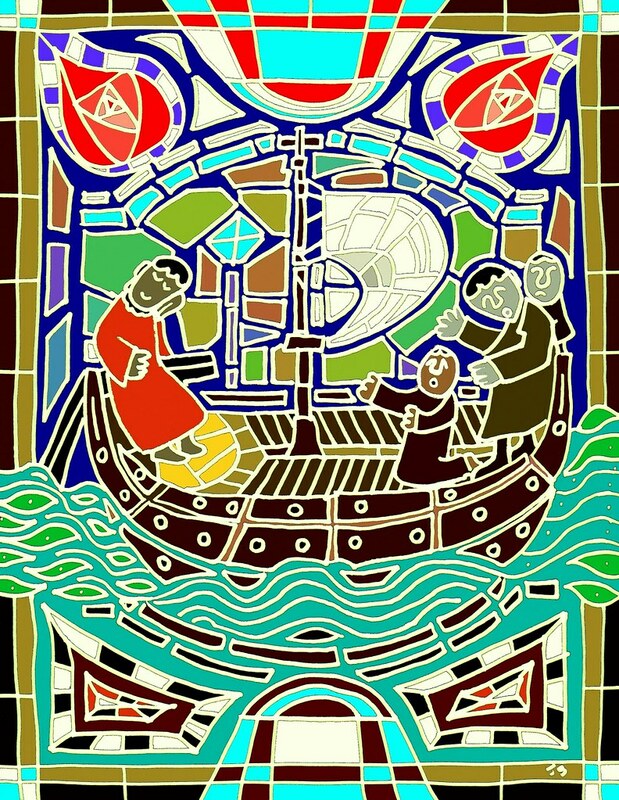 Today’s drawing is one of John’s stained-glass designs called “Jesus Calms the Storm.” If you would like to view a larger version, please click here.